That we only have essentially one more month of summer is incredibly upsetting. However, there are a few upcoming block parties to help you deliciously savor the final weeks of sunshine and warmth. For the first time the Steam Plant and Baby Bar/Neato Burrito team up to bring you the first ever Steam Plant Block Party. Put on with the help of folks behind Unifest and theSteam Plant Rooftop Happy Hours, the new event will be held in the large parking lot between the two businesses. In fact, you can think of this event as a mini Unifest, but without the art side of things. The lineup includes some local indie (rock and electronic) favorites along with the Hoot Hoots, a Seattle indie rock band that can never seem to get enough of our fair city. $60 for two people gets you in all four days, free meals and drink tickets. The All Age Rage and Octapalooza people have come together to make a music festival baby with this upcoming crazy four-day party held in the Viking parking lot. 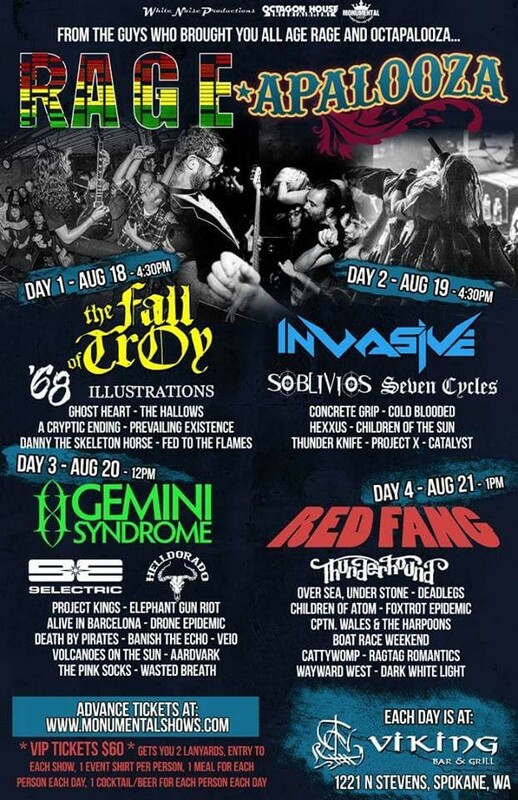 The lineup sings sweetly with Fall of Troy and Red Fang headlining two of the nights (see the full lineup to the right) but the most exciting thing about the vent is how many local bands get to share the stage with some top indie Northwest talent. Single tickets start at $10 per day if you buy beforehand, but $60 gets you the best deal for all four days. The Garland District is one of the most eclectic and artistic areas of Spokane and you can expect two packed music stages at next Saturday's Garland Street Fair. The main stage features many established Spokane acts, including Peter Rivera of Rare Earth and Sammy Eubanks, while the smaller stage is showcasing acts for the more indie rock-inclined with artists like the Bight, the Backups and Ragtag Romantics. The shows run all day, meaning you should find at least a little time to head down to the fair and enjoy some free music while scoping out the many street vendors and boutique businesses. See the full music lineup here. While this event isn't exactly outside or even in summer, you should get Bartfest — an indie music festival held between nYne and the Bartlett now in its third year — on your radar right now. The lineup so far consists of Twin Peaks, TOPS, Tangerine, White Reaper, Soft Sleep and the Echolarks but there will be about 16 bands in total when all is said and done.